Much like the initially despised Eiffel Tower, Paris' Sacré Coeur has always had its fair share of detractors. Parisians frequently refer to it, with more than a touch of disparagement, as "that big meringue" that sits with its turrets jutting out like stiff peaks atop the hilly heights of Montmartre. Others aren't big fans of its gold-leaf heavy, Romanesque and Byzantine-style interiors, deeming them a little too gaudy. Nevertheless, the basilica remains one of the city's most iconic and instantly-recognizable structures and is necessarily included in our top 10 recommendations for what to see in Paris on a first trip. In spite of the general consensus that the Sacré Coeur lacks the sucker-punch beauty and mystique of Notre-Dame or the Sainte-Chapelle, over a million tourists flock to visit the site every year. They trudge up some 270 stairs to reach it at the top of the hill or take the adjacent funicular, all to see firsthand the odd place of worship that has regained popularity thanks to its prominent appearances in films such as Amélie. Such dedication is perhaps fitting, since the area on which the basilica stands is a historic pilgrimage site. The bottom line? Especially if you're only just discovering the French capital, a visit to the late-nineteenth century basilica is worth a visit-- if only to thoroughly take advantage of the sweeping panoramic views afforded from the terraces outside. In fact, many people forego going inside altogether-- although the interiors certainly have plenty to offer (scroll down for highlights and architectural details). The Sacré Coeur is located in central northern Paris, in the heart of the Montmartre neighborhood and the 18th arrondissement (district). Metro: Anvers or Pigalle (Line 2); Jules-Joffrin (Line 12); Abbesses (Line 12). From all of these stations, you will have to take a short walk and then either climb the 270 stairs to the basilica, or the funicular located at left at the bottom of the hill (the price is one regular metro ticket). 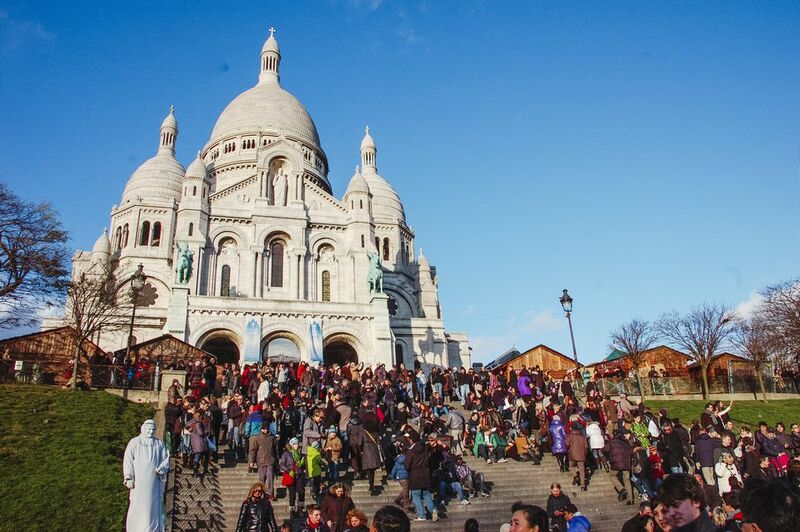 The Sacre Coeur is open year-round, including on bank holidays, from 6:00 am to 10:30 pm. Entry is free for all. Reservations are not required for groups, but please do respect the atmosphere of near-silence and keep voices to a whisper. To access the Dome (from which spectacular panoramic views of the entire city can be enjoyed), use the entrance outside the Basilica, on the left-hand side. That is, if you have the energy to climb another 300 stairs to the top-- there's no elevator. The Dome is open daily from 8:30 am to 8:00 pm (May-Sept) and from 9:00 am to 5:00 pm (Oct through April). Visitors are charged for access, but ticket prices are subject to change and no further information is available on the official website. No guided tours are currently offered, in an effort to preserve the meditative character of the site. However, you can download a free audio guide here, then listen with headphones during your visit. The Sacre Coeur (main interior site) is accessible to disabled visitors, but some may need special assistance. Access the Basilica via the ramp and elevator located at 35, rue du Chevalier de la Barre, at the back of the building. Accessible entry opening times: 9.30 am to 5.30 pm. Call +33 (0)1 53 73 78 65 or +33 (0)1 53 73 78 66 for more information about services and special tours for disabled visitors. Unfortunately, the area is well-known for harboring scam artists and pickpocketers, so be vigilant at all times. Tourists are often solicited by men waiting on the steps around and up to the basilica; their modus operandi is frequently to show you brightly colored "friendship bracelets" and to offer to let you test how they look on your arm. Once tied on (tightly) they demand payment. Don't fall for this: firmly say "Non, merci" if anyone approaches you offering these wares, and keep moving. Also make sure that you keep your purses and bags close to the body, and do not keep valuables like passports or wallets in backpack pouches or pockets: pickpockets are known to operate in this tourist-heavy area. The present-day basilica is, in fact, the latest place of worship in a long line of temples and churches that have stood on the Montmartre knoll over many centuries. The Druid peoples of ancient Gaul erected temples dedicated to Mars and Mercury here before the Romans built their own temples during the imperial reign. During the 9th century, Paris became a major Christian pilgrimage site under the influence of Saint Genevieve, who persuaded religious officials to erect a chapel on the Montmartre knoll in honor of Saint Denis. Even the name of the area reflects its status in the early medieval period as a place of importance to pilgrims: "Montmartre", of course, means "Mount Martyr". In the 12th century, the first major church in Paris, L'Eglise Saint-Pierre, was built not far from the present-day Basilica, next to the long-lost Benedictine Abbey of Montmartre. Destroyed during the French Revolution of 1789, all that remains of the Abbey is a vineyard, now used to celebrate an annual wine harvest each year (the Vendanges de Montmartre). Following several tumultuous revolutions, the area once again was elected for a new major site of Catholic worship-- but only a war between France and Germany that broke out in 1870 spurred its construction. The Franco-Prussian War and the "Commune" Revolution in 1871 were both bloody, messy affairs that left relations between France, Germany, and the Vatican in shambles for a variety of complex reasons. Catholic leaders in France decided, in response, to build a new place of worship in Paris as symbolic penance for these years of violence and disarray, and Montmartre was chosen for the erection of a new (minor) basilica. With design entrusted to Paul Abadie, construction started in 1875, but the project took years: the basilica in its finished state only opened in 1914-- the same year that World War I broke out. This was a touch ironic, for a site constructed as a symbol of peaceful repentance. The Sacré Coeur was built in the Romano-Byzantine style, which is why it stands out from its high gothic cousins such as Notre-Dame. It has more in common with sites such as the San Marco Basilica in Venice. The strikingly white limestone exteriors mark the Sacré Coeur as Parisian, the limestone having been sourced from a nearby quarry. The facade features two prominent equestrian statues that you should make note of: Joan of Arc on horseback, and King Saint Louis also in riding mode. Inside, heavy use of gold leaf and mosaics gives the basilica a rather "busy" quality-- not to the taste of all, but nevertheless very striking. Light from the stained glass windows points attention toward the apse at the back. The original mosaics were completed in 1922. The stained glass windows are not the originals: these were unfortunately destroyed by bombs during World War II in 1944, and subsequently restored. The grand organ is the work of Aristide Cavaillé-Coll. After the Eiffel Tower, the prominent Dome is the highest point in Paris: it's worth a climb for the incomparable views. The Bell weighs an impressive 19 tons-- it's one of the world's heaviest and largest-- and was built in 1895 in the Alpine French city of Annecy. Panoramic Views From the "Terraces"
As mentioned earlier, many visitors never step foot inside the basilica at all, instead admiring the exteriors and enjoying photo ops, and above all taking advantage of remarkable panoramic views from the large terrace. The Eiffel Tower, Notre-Dame Cathedral, Montparnasse tower, and many other major Parisian monuments can be spotted from there, on a clear day. On New Year's eve, this is a popular place to assemble to count down, and firework shows are often on the menu.